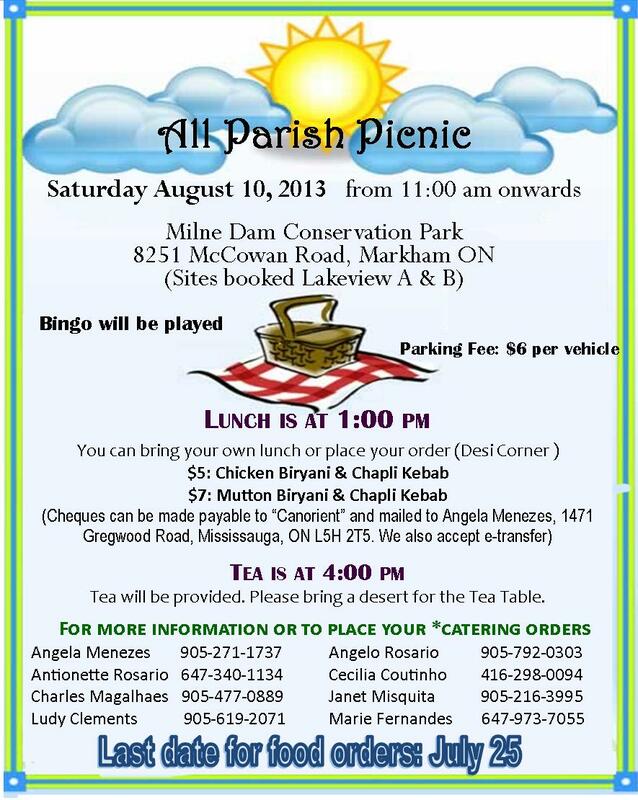 The Toronto Chapter of The Canorient Christian Association will be hosting their annual All Parish Picnic on Saturday August 10th 2013 from 11:00 am onwards. This year’s picnic will be held at beautiful Milne Dam Conservation Park (8251 McCowan Road, Markham). The sites that have booked for this event are Lakeview A & B. There will be lots of activities for adults and kids. Lunch will be at 1:00 pm. You can either bring your own lunch or contact a committee member to place your order to have lunch catered (from Desi Corner) for you. $5 for Chicken Biryani & Chapli Kebab. $7 for Mutton Biryani & Chapli Kebab. Tea will be served at 4:00 pm and will be provided, but please bring a dessert for the dessert table. Parking is $6 per vehicle, and Milne Park Authorities do not allow propane tanks.